My do-over of this dish didn’t work out as well as the first version, so I didn’t end up submitting this to food52‘s “Your Best Eggplant Dish” contest, but since so many people have asked I figured I’d post the recipe here. I used different types of eggplant for the first version and the second, and the larger eggplant in the second version didn’t work out nearly as well in the finished dish. 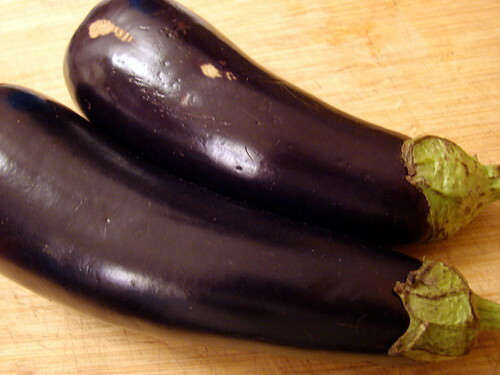 Go with eggplants like the ones pictured here, in the small-to-medium range and more long than bulbous in shape. Also, keep in mind that a high-acid tomato is going to make the flavor of the chile flakes more pronounced in the Pizzaiola Relish, so choose and season accordingly. In a bowl, combine the chopped tomato, grated garlic, marjoram or oregano, red chile flakes and a generous pinch of salt. Toss to combine, then drizzle in the olive oil and set aside. Wash the eggplants and trim off the tops. Slice lengthwise into “steaks” about ½- to ¾-inch thick. Salt both sides fairly heavily and place the eggplant slices on a rack for 10-15 minutes. Rinse off the salt and any bitter liquid that has leached out and pat dry. 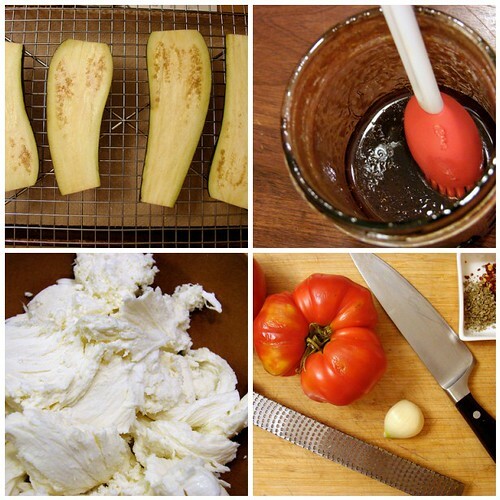 Combine the balsamic, oil, tomato paste and a pinch of salt in a small jar, screw on the cap and shake until emulsified. Light a grill or pre-heat a grill pan, baste the eggplant slices with the balsamic mixture and grill over high heat for a few minutes per side. Continue basting until the outsides are nicely caramelized. Remove the eggplant steaks from the heat and place on a baking sheet. Tear the mozzarella into shreds and scatter over the top of the eggplant steaks. Broil until the cheese is browned and bubbly. Place eggplant on plates (on a bed of young arugula or spinach, if you like) and top with generous spoonfuls of the Pizzaiola Relish. Yum! I don’t reallly like eggplant, but this could work with chicken, right? Yes, I would imagine you could swap out the chicken for the eggplant. What I was going for was a sort of meatless variation of steak or pork chops “Alla Pizzaiola”, with the balsamic mixture basted on the eggplant to give it more flavor. If you try it with chicken, let me know how it works. I don’t eat a lot of eggplant either – the texture can become so offputting, but I like that this treatment would probably keep them “steaky” and firm (plus, it’s an excellent excuse for fresh mozz. om nom). I’ve been giving away the eggplant I keep getting in my CSA box, but I’m going to try this! Your original post on this inspired me and last night we had essentially the same thing. I did mine in the oven because sometimes I can’t bring myself to start the grill on a weeknight. Instead of the relish I did a simple lightly cooked tomato garlic mix with some roasted chicken sausage and served it over some swiss chard. mmm. I feel I must be the defender of eggplant. The thing is, it really has to be cooked well to bring out its best flavor and texture, so if you think you don’t like it you may not have had it prepared properly. This recipe sounds delicious and I will try it. I often also grill eggplant and then either bake it with a dollop of tomato sauce and cheese or make a quick “pie” in the oven. Of course a higher fat option is to dip the raw eggplant slices in flour, then egg and fry them lightly before assembling a Parmigiano style dish in the oven with layers of tomato sauce and mozzarella. Many people who’ve said they don’t like eggplant really enjoy it – they almost don’t recognize the vegetable anymore because it becomes creamy. Anyway, great recipe here, Jennifer, thank you! This looked so amazing that I had to try it last night….. I LOVED the marinade for the eggplant, and the relish. Overall it was still too chewy and eggplanty for me though- I guess I am just not an eggplant lover, but I keep trying! Thank you for sharing the recipe. That is a nice idea, turning eggplant into a delicious viand! I am looking for more recipe tips, thank you! Thanks for the inspiration! I really enjoyed it: http://yummythings.tumblr.com/post/189888051. Try it on top of the arugula! I love eggplants. This sounds like a great recipe for them. Jennifer, I just made this and I am in love! I may never cook eggplant any other way ever again!